Local farms throughout Massachusetts, and across the U.S.A. are offering Community Supported Agriculture (CSA) as a way to introduce local food sources to area residents, while sustaining family-owned farms. 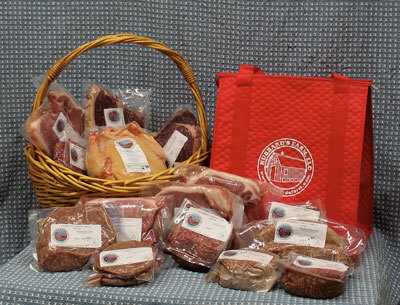 Hubbard's Farm Meat CSA presents an opportunity for you to invest in local agriculture. By becoming a member of our CSA, you will make and advanced financial commitment to our farm. In return, you will receive a portion of the farm-raised meats we produce. Chuck Wagon: Investment $288 for a 6-month membership period. Meat distribution is 8 lbs. per month ($6.00 lb.) and includes 6 lbs. Ground Beef and 2 lbs. Sausage. Breakfast Club: Investment $90 for a 6-month membership period. Meat distribution includes 1 Ham Steak, 1 lb. Bacon, 1lb. Breakfast Sausage, and 1 doz. Eggs every other month. A limited number of CSA shares are available on a rolling enrollment schedule. You must sign up by the 10th of each month to pick up that month. Pick up is on the 3rd Thursday 10-7 and Saturday 9-12 of the month. The first pick up is Thursday, March 16 or Saturday, March 18, 2017. Hours are listed in the footer of this website. Payment is due in full by first pick up. We accept cash, check, Visa or MasterCard payments. You can download the CSA Enrollment Form here. For more information, please contact us at 978.464.2041 or email info@hubbardsfarm.com.